Sub-Zero and Wolf appliances are famed for their upper tier range so, understandably, there is no shortage of professional chefs, famous people and informed domestic clients wanting to endorse their incredible range and benefit from arguably the best cooking and cooling appliances on the planet. I can’t imagine it would have been difficult for Craig and Ricky Davies who run Westye, the group responsible for the sole distribution in the UK, to find willing ambassadors for the company. One of these ambassadors holds a particular interest with McCarron & Co for a number of reasons. This person had a pro bike racing career from the age 19, is the only Briton to have worn all of the leader’s jerseys on the Tour de France, has written two books, contributed heavily on two films and now presides as an insightful co-commentator on the Grand Tours, with the highlight undoubtedly ITV’s Tour de France coverage with Ned Boulting. 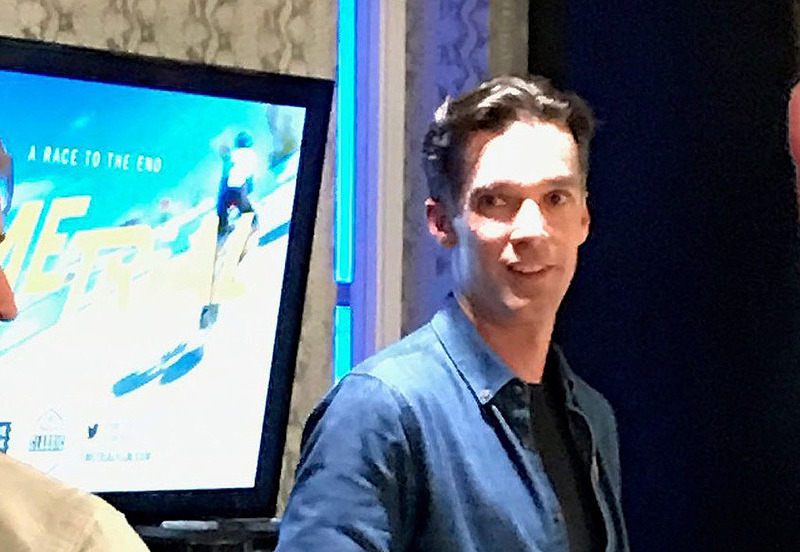 He is of course David Millar and McCarron & Co were invited to the Sub-Zero and Wolf Knightsbridge flagship showroom to take a look at his latest CHPT3 collaborations (CHPT3 being the beautiful tailored cycling clothing brand that he is a huge part of). I think we almost sent an acceptance to the invites for the evening back before they had arrived to us by email, so excited we were and we had good cause to be! The CHPT collaborations are with a number of very desirable brands, admittedly more desirable if you love your cycling! The first collaboration was on view as soon as we entered the showroom, the CHPT 3 special edition Brompton. As keen Bromptoneers and lovers of the original (and best) folding bicycle, we were keen to inspect the racers Brompton, complete with titanium parts, exclusive paintjob and racing slick tyres. Sat next to the Brompton and very diametrically opposed in terms of bike classification was the CHPT 3 Factor One, a road bike designed by racers with the sole mission of covering tarmac extremely rapidly. Both bikes are rather beautiful in their own rights and if only McCarron & Co had a little more space in the Chelsea showroom….! If you’ve never been to Sub-Zero and Wolf London, it should be on your must visit list, especially if you are embarking on a project commanding this calibre of appliance. McCarron & Co were commissioned 2 years back to design and install the furniture that houses and acts as backdrop to the appliances, so it’s also a good opportunity to study our cabinetry in a very different and wonderful setting. Downstairs, was a hub of activity and chatter, so glasses of champagne were gratefully accepted and enjoyed whilst perusing the beautiful range of CHPT 3 Castelli clothing that was on display. I had read all about these aspirational garments but wasn’t really aware just how high a level the tailoring and material mix was, which made me realise how inferior my own cycle clothing wardrobe was in comparison! Some nibbles and then the main event and a chance for this fantastic venue to come in to its own – the trailer of David Millar’s forthcoming film ‘Time trial’ to be shown to an eager audience. The film previews at the Amsterdam film festival and from what the trailer promised, looked to be a must watch for anybody keen to have an insight to the toughness of the sport, warts and all, with the camera angles and dialogue that you won’t find on a TV show anytime soon….Needless to say that the trailer served to whet the appetite to watch the entire film as soon possible. 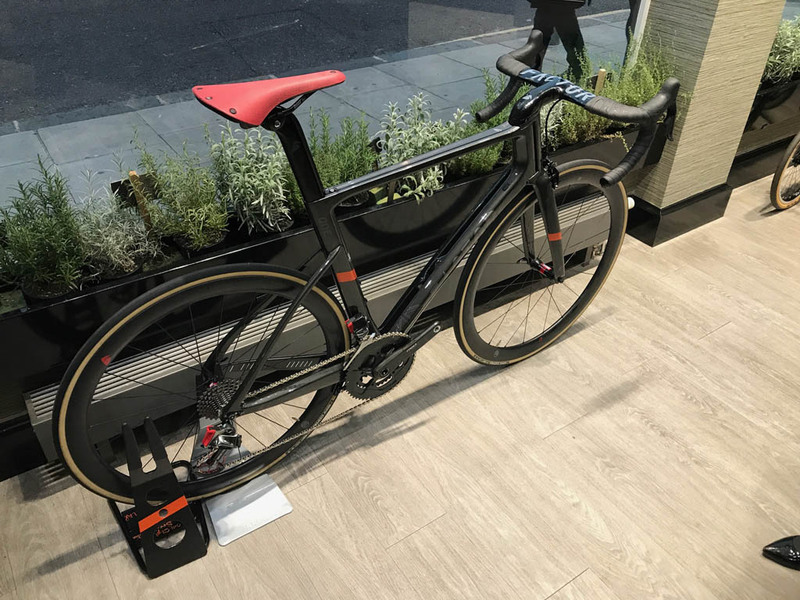 There were some truly wonderful items on display, from the bikes to the Castelli CHPT 3 clothing and nothing looked out of place in the showroom. It made me realise what a fantastic venue Craig and his team have created just up the road from us, and we are just waiting with baited breath to find out what the next event is – I just hope that’s its cycling related again!! 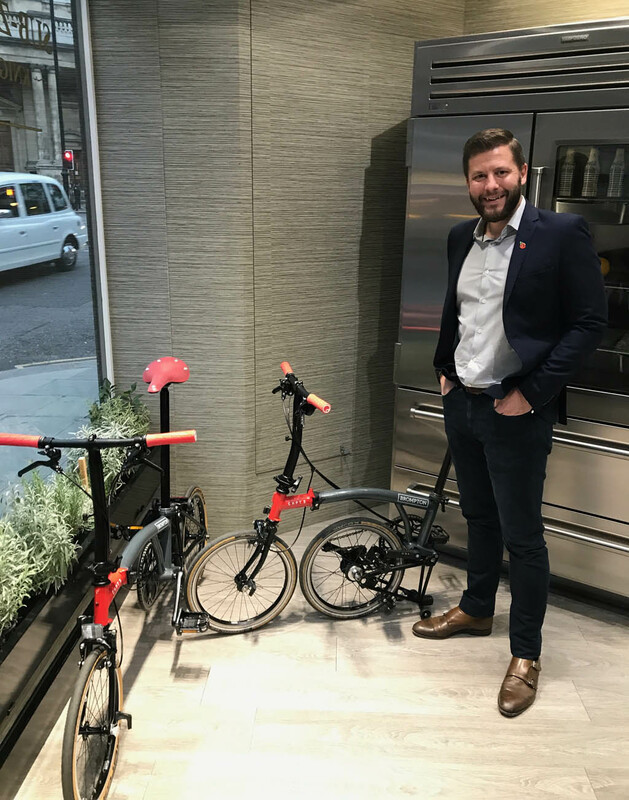 If you’re visiting the Sub-Zero and Wolf appliances showroom then the McCarron & Co showroom is a 10 minute walk away and whilst you might only see one or two Bromptons there is plenty of bespoke, luxury furniture on display as well as more Sub-Zero and Wolf appliances.